Adélaïde Labille was born in Paris in April 1749, the youngest of eight children, to Marie-Anne Saint-Martin and Claude-Edme Labille. Her father was a marchand du corps de la mercerize (a haberdasher) and he and his wife owned a haberdashery shop, La Toilette, in the rue Neuve des Petits-Champs, at the heart of the capital. Their home was also situated on this street. The shop became very popular and by the 1760’s it had built up an élite clientele. One interesting fact about the family shop was that in 1761 a young girl, Jeanne Antoinette Bécu, applied to work in it, was taken on and became friends with Adélaïde. 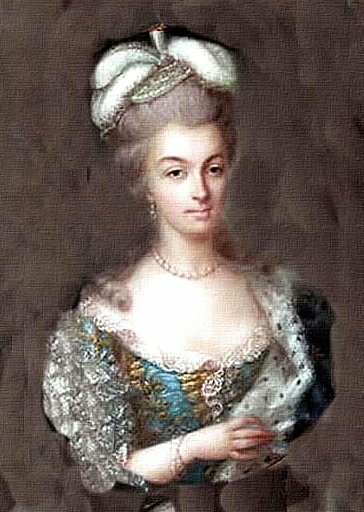 Whilst there she met the comte du Barry, became his mistress, left the shop and would later become la maitresse-en-titre, the chief mistress of Louis XV. Giving birth to eight children took its toll on Adélaïde´s mother and she was often laid low with one illness after another. In 1768, when Adélaïde was nineteen years old, her mother died. Little is known about Adélaïde’s siblings except that one of her older sisters, Félicité, married the painter and art collector, Jean Antoine Gros in 1764. However in a letter Adélaïde wrote to Comtesse d´Angiviller in 1783, she said she was the only surviving member of the family. So what made Adélaïde want to become an artist? One reason could be the location of the family home, which was close to the Palais Royale and had become the hub of theatres, music halls and dance halls but was also home to a large collection of professional artists as it was close to the Louvre, which at the time was the headquarters of the Académie Royale. The most talented artists of the time, who were willing to comply with the strict guidelines of the Académie, had become members of this august establishment but many others painters who failed to be accepted into the halls of the institution had become members of the city’s trade guild, the Academy of Saint Luke. It is thought that Adélaïde may have got her earliest artistic tuition from some of her artistic neighbours, one of whom was the Swiss-born painter of portrait miniatures, François-Élie Vincent, a member of the Guild of Saint Luke, who also lived in rue Neuve des Petits-Champs. In 1769, Adélaïde, aged twenty, joined his classes and it was during this time as Vincent’s apprentice that she was able to exhibit some of her work at the Académie de Saint-Luc. This was also the year she married. Her husband was Louis-Nicolas Guiard who was an official in the Treasury of the Clergy and who lived on the same street as Adélaïde. The ceremony took place at the local church of St Eustace on August 25th 1769. The marriage contract recorded that Adélaïde was a professional painter at the Académie de Saint-Luc. 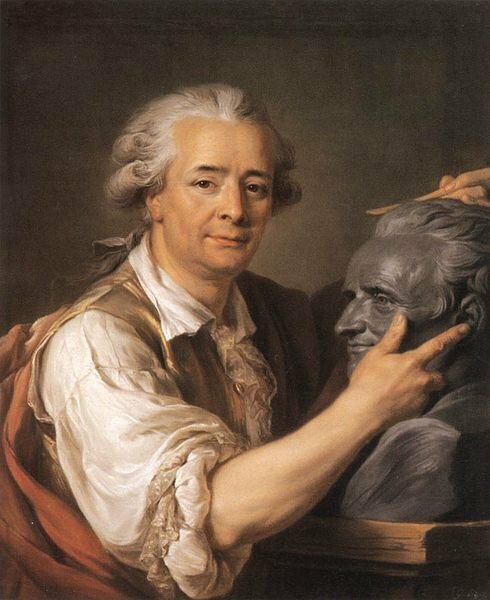 Five years on, in 1774, Adélaïde had moved on artistically to work with pastels under the tutelage of the distinguished seventy year old French pastelist, Maurice-Quentin de la Tour who had his studio a few blocks away from Adélaïde’s home. It is believed that Adélaïde had been introduced to him by one of his former students and a neighbour of hers, the Swedish portraitist Alexander Roslin. 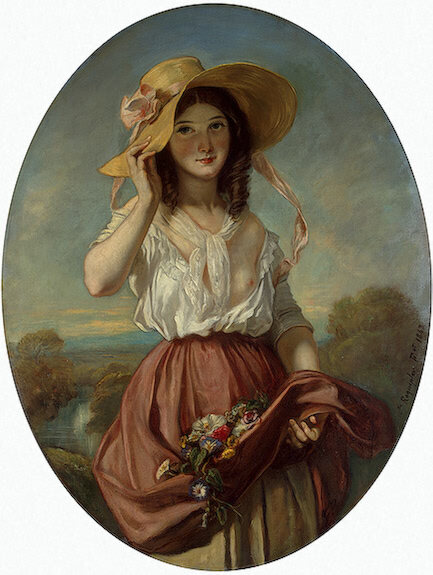 Roslin, an Academician since 1753, was married to the painter, Marie Suzanne Giroud, and was a great believer in women’s right to become artists and was aware of the problems they had in trying to progress as professional painters. Art historians believe that Roslin was the person who would later put forward Adélaïde’s name to become a member of the Académie Royale. Three years on, around 1777, she started to work in oils and her introduction to, and tuition in this painting media came from François-André Vincent the son of her former tutor. He was to become a leader of the neoclassical and historical movement in French art. They became very close and such closeness fuelled rumours of a romantic tryst between the two artists. Whether such rumours damaged her marriage or whether there were other reasons, the couple went their own separate ways in 1777 and her child-less marriage to Guiard ended in legal separation in 1779. 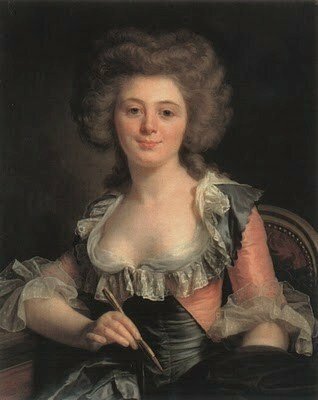 Adélaïde however kept signing her work Labille-Guiard. The relationship between Adélaïde and Vincent is examined in the 2012 book by Elizabeth Mansfield, entitled The Perfect Foil: François-André Vincent and the Revolution in French Painting and in it she suggests that the pair had been very close as far back as 1769 when she worked in his father’s studio, but the fact that he was a Protestant found little favour with Adélaïde’s father and so marriage was not a possibility. However following the separation from her husband and after the reformation of divorce laws, the couple were able to marry in 1800. Adélaïde’s second husband François-André Vincent, being a talented artist and having the right connections, became a student at the Académie Royal in 1765, three years later won the prestigious Académie prize, Prix de Rome and was awarded a four-year scholarship at the Palazzo Mancini, the French Academy school in Rome. On his return to Paris in 1782 he was made a full Academician. For Adélaïde, her artistic journey was far more difficult. Females wishing to become artists struggled to receive artistic training unless they had family members who were artists and who had their own studios but this was not the case for Adélaïde whose father was a merchant. However as I said earlier she did eventually secure artistic tuition and with the support of Roslin she became a member of the Académie Royale on May 31st 1783, the same day in which Élizabeth Vigée-Lebrun was received into the Academy. The addition of these two females to the Academy brought the number of female Academicians to four. Anne Vallayer-Coster, the floral and still life painter and the miniaturist, Marie-Thérèse Réboul, also known as Madame Vien being the other two Academicians. A royal decree had set a cap of four female Academicians at any one time. 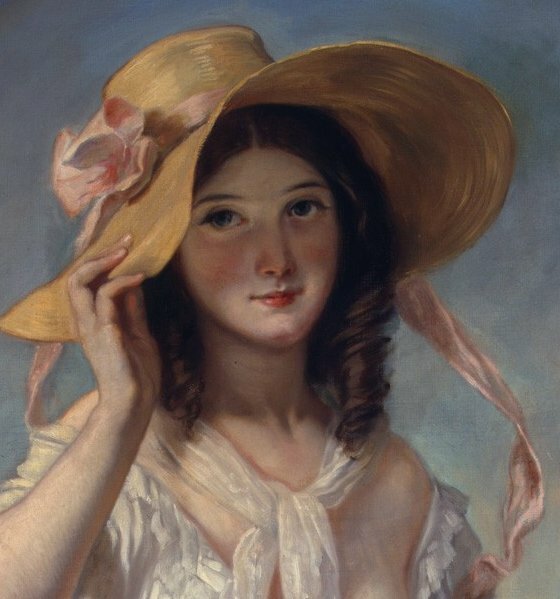 The French Arts Minister, comte d’Angiviller, had obtained the royal ruling and had stated that such a cap would be sufficient to honour the talent of female artists but added condescendingly that they could never be useful to the progress of the arts! In 1780 Adélaïde had set up her own studio and had accepted a group of women pupils, several of whom went on to become successful portraitists. 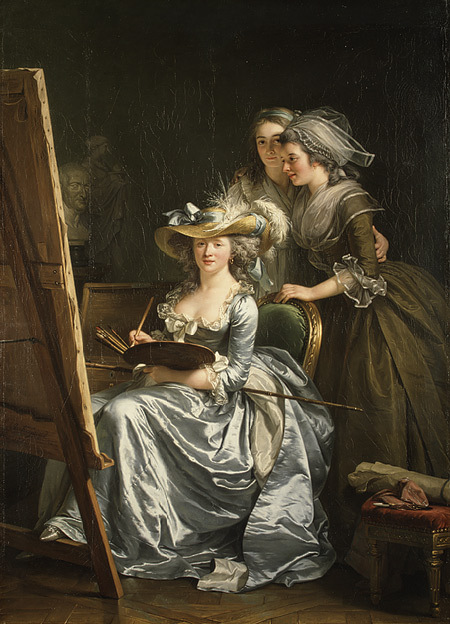 By 1784, her reputation as a gifted art teacher was firmly established and one of her most famous works, which is now housed in the Metropolitan Museum of Art in New York, is her 1785 work entitled Self–Portrait with Two Pupils, Mademoiselle Marie Gabrielle Capet and Mademoiselle Carreaux de Rosemond, which highlights her role as a tutor. 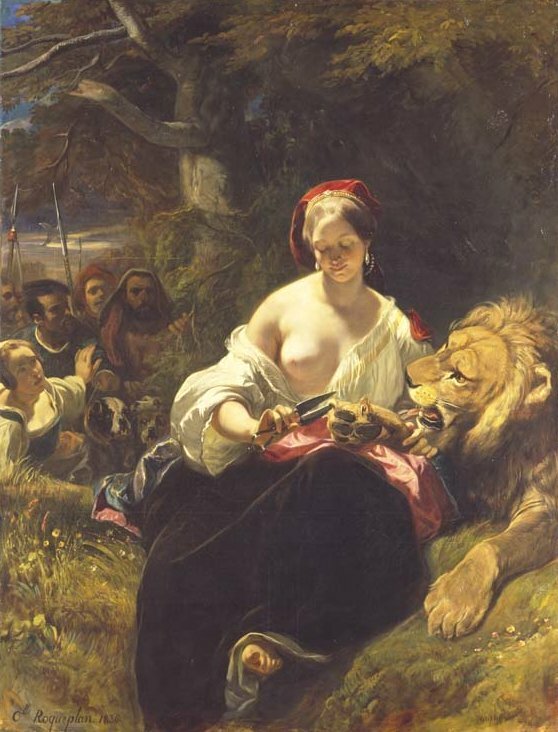 The work has often been construed as a piece of propaganda, symbolising the dispute over the role of women in the Academy. She has portrayed herself in her studio which is richly furnished and this was her way of denoting her favourable financial situation. She is seated in front of a large canvas and behind her stand two of her students, Marie Gabrielle Capet and Mademoiselle Carreaux de Rosemond, who have been depicted in much plainer clothes. Adélaïde wears a sumptuous and expensive low cut gown and large plumed hat neither of which would have been worn by an artist at work but is more likely to be a declaration of her femininity, and the fact that she is an artist who moved in high society. The feminist stand on art education was further enhanced by the inclusion of her two female students both of whom would become great artists in their own right. In the background she has included the bust of the Vestal Virgin as an additional emphasis of the feminist mood of the time. One can tell by this work that she had a great belief in herself as an artist. So if she wanted to paint a self-portrait, why include two other people in the work? The reason for their inclusion is probably two-fold. First of all, because she was a strong proponent of the education of women artists, it is her statement of belief that females should receive artistic tuition and secondly she is demonstrating her ability as a group portraitist and this painting received critical acclaim when it was exhibited which led to many commissions for family group portraits. This was indeed a clever self advertisement by the artist. One of the pupils in the painting, Marie Gabrielle Capet, became Adélaïde’s close friend and her favourite student. She became a miniaturist and pastel portraitist in her own right and lived with Adélaïde Labille-Guiard before and after the artist’s marriage to Vincent. After Adélaïde died Marie Gabrielle Capet remained in the house and continued to care for Adélaïde’s husband. 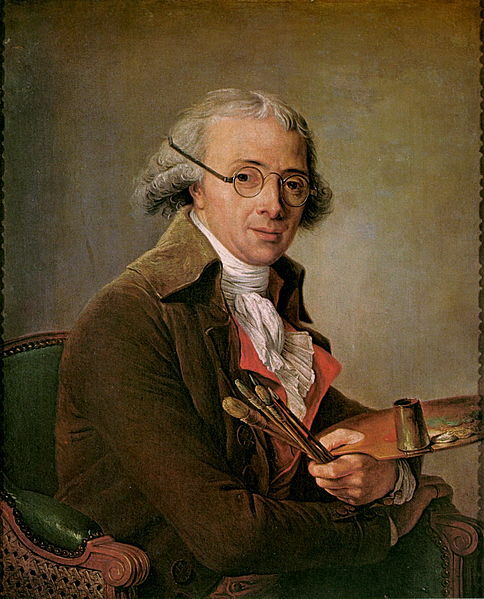 Labille-Guillard was an extremely talented portraitist and unlike her fellow Academician, Lebrun, she received portrait commissions from both sides of society, members of the aristocracy as well as revolutionary figures. 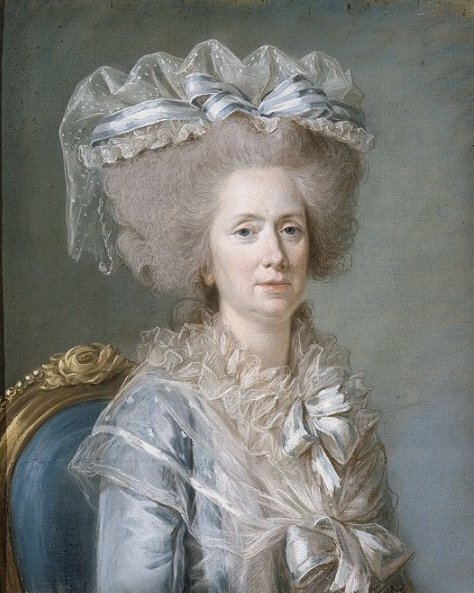 She also received royal commissions and one of her royal patrons was Princess Marie Adélaïde, the aunt of Louis XVI and through this received an annual government pension of 1000 livres. Labille-Guiard painted the portrait of the princess and her sister, Princess Victoire-Louise, as well as a portrait of the sister of Louis XVI, Princess Élisabeth. Because of these royal commissions to paint portraits of female family members of Louis XVI, she came to be known as Peintre des Mesdames. She would normally have been also allowed a studio at the royal court but because her pupils were female that was not to be. However such royal patronage, in some ways, made Labille-Guiard politically vulnerable at the time of the French Revolution of 1789 and she was made to destroy a number of her portraits of court members of the fallen monarchy and for a time she decided, for her own safety, to leave Paris. At the Salon exhibition of 1791 she exhibited portraits of two prominent members of the French National Assembly, Maximilien Robespierre and Armand, duc d’Aiguillon. In 1795 Adélaïde was granted artists’ lodgings at the Louvre and had her government pension enhanced to 2000 livres. As a member of the Académie Royale she continued to regularly exhibit her portraits at the Salon until 1800. 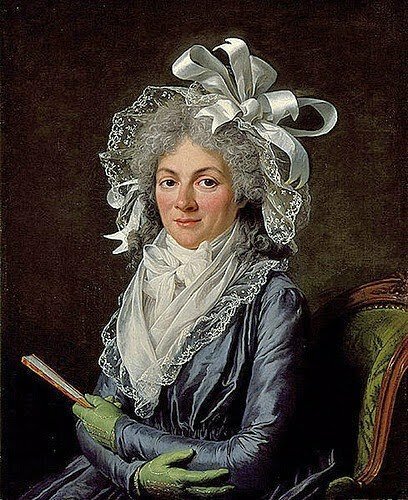 Adélaïde Labille-Guiard died in April 1803, aged 54. Whilst researching the life of Adélaïde Labille-Guiard I came across a book entitled Adélaïde Labille-Guiard – Artist in the Age of Revolution by Laura Auricchio. It is from this literary work that I gleaned most of the information regarding her life. I can highly recommend the book if you want to find out more about the artist and study some of her exquisite works. 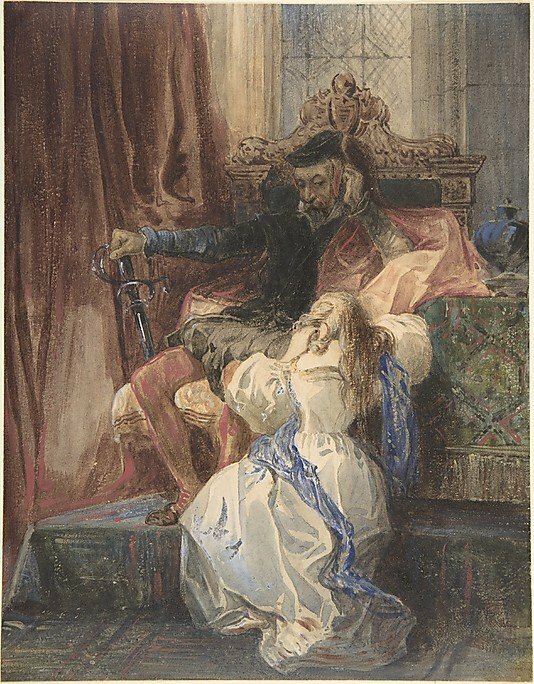 In this blog I am returning to look at female artists and I am featuring a highly talented lady whose superb artistic talent rubbishes Boccaccio’s theory. Today, I am looking at the struggle she, like other female painters of the time, had fighting their way through to success in a male-dominated field. One of my favourite paintings is by the eighteenth century French female artist Louise Elisabeth Vigée Le Brun (See My Daily Art Display November 21st 2012) and recently I have been reading about a contemporary of hers, the very talented 18th century French painter who, like Le Brun, gained the patronage of Marie-Antoinette, the wife of the French monarch, Louis XVI. She is Anne Vallayer-Coster. Such royal patronage was the ultimate prize for aspiring painters as it led to many lucrative commissions. 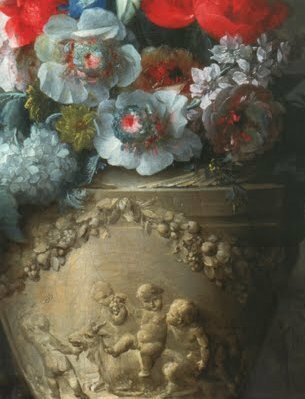 However, unlike Le Brun, Anne Vallayer was not solely a portraitist but was an exceptional still-life and floral painter. Anne Vallayer-Coster was born in Paris in December 1744. She was the second of four daughters. Her mother was a painter of miniatures. Her father, Joseph Vallayer, was a goldsmith working at the Gobelins Manufactory Company in Paris, and the family lived on the grounds of the Gobelins Manufacturing complex, which produced the finest tapestries as well as luxury objects, which often adorned the royal palaces. In 1757 the family moved to another area of Paris and Anne’s father started to trade in jewellery. His business soon expanded with royal patronage and was granted the right to produce metal products for the military. Anne Vallayer became interested in sketching and painting at an early age and her mother encouraged her by arranging for her to have private tuition from an art teacher, Madeleine Françoise Basseporte, a one-time pupil of the great French botanical painter, Claude Aubriet, and she, like him, was made the Royal Painter at the court of Louis XV, teaching the royal princesses to paint flowers. Anne Vallayer learnt well from Basseport and she too was to become a talented botanical artist. Her next art tutor was the landscape painter Claude Joseph Vernet. In a short period of time Anne Vallayer became an accomplished artist concentrating on floral still-life works. Her works were a beautiful juxtaposition of the flowers and inanimate objects such as books, musical instruments, tableware and furnishings. The inanimate objects Vallayer included in her floral depictions allowed her to highlight her artistry by depicting the various different surfaces, such as glass, pewter, and silver and how the light played differently on each of them. The still-life works often included aspects of trompe-l’oeil affording depth perception. In 1770, when she was just twenty-six years of age, such was her artistic talent that a number of her tutors and fellow artists suggested that she should apply to become a member of the Académie Royale. To gain admittance to the Académie Royale de Peinture et de Sculpture she submitted two reception pieces. 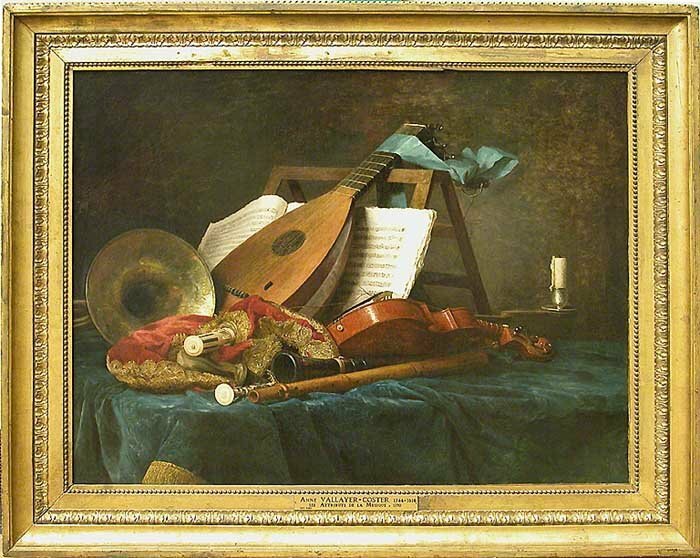 They were still life works entitled Les attributs de la peinture, de la sculpture et de l’architecture (The Attributes of Painting), and Attributs de la musique (The Attributes of Music). 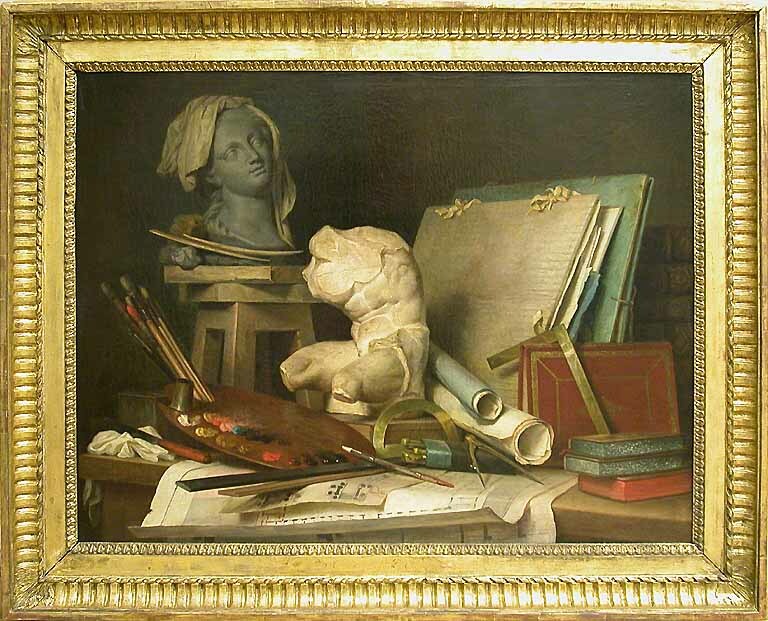 It could be that Anne Valleyer was quite canny when she put forward to the Académie elders her reception piece The Attributes of Painting, as all the objects we see depicted are references to the various arts taught at the academy. The brushes and palette symbolize painting, the bust and torso epitomize sculpture, and the building plans signify architecture. The books and portfolios of drawings symbolize the scholarly facet of the fine arts. It is thought that the bust is a self-portrait of Anne. This should have been the happiest time of her life but the sudden death of her father overshadowed the joyous news. With the main family breadwinner now gone, her mother had no choice but to take over the family business, whilst Anne helped the family finances with the sale of her paintings. 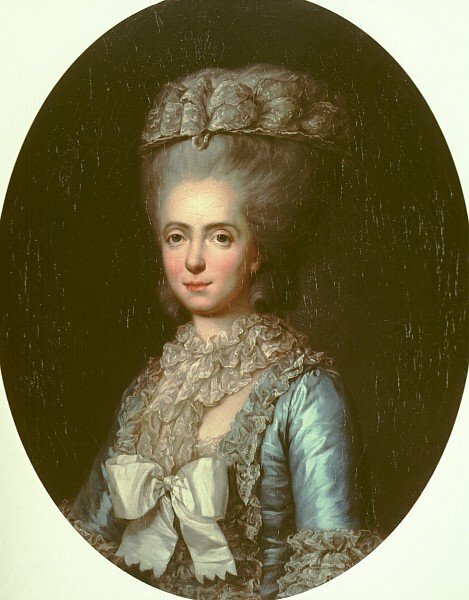 She completed a number of portraits of the royal family including one of Marie-Antoinette. It is said that the queen disliked her portrait. The French critics who were complimentary with regards her floral works, were dismissive of her figurative work. With this in mind and being aware that she had major rivals in that genre, including two fellow Academicians, Elisabeth Vigée Le Brun and Adelaide Labille-Guiard, who were the favoured female portraitist of the time, she decided to concentrate on her still-life painting. Art was a very important facet in the life of the upper class and nobility. A thorough knowledge of which artists were in vogue and who were the up-and-coming artists was of great importance. Soon through word of mouth in Court circles and the glowing evaluations of her artistic ability, the floral still-life work of Anne Valleyer came to the attention of Queen Marie-Antoinette. Anne Valleyer received a number of painting commissions from Marie-Antoinette and many members of the royal court as well as a number of wealthy art collectors. As was the case with Elisabeth Vigée Le Brun, the artist and queen became friends and in fact, it was the queen who, at a ceremony at Versailles in 1781, witnessed and signed off the marriage contract between Anne and her betrothed, Jean-Pierre-Silvestre Coster, a wealthy lawyer and respected member of a powerful family from Lorraine. In total, Anne Valleyer-Coster painted over one hundred and twenty floral still-life works. 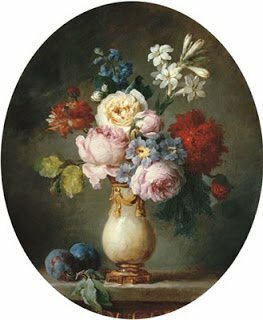 One painting which she completed in 1781 entitled A Vase of Flowers and Two Plums on a Marble Tabletop was used as a model by Gobelins for one of their tapestries. 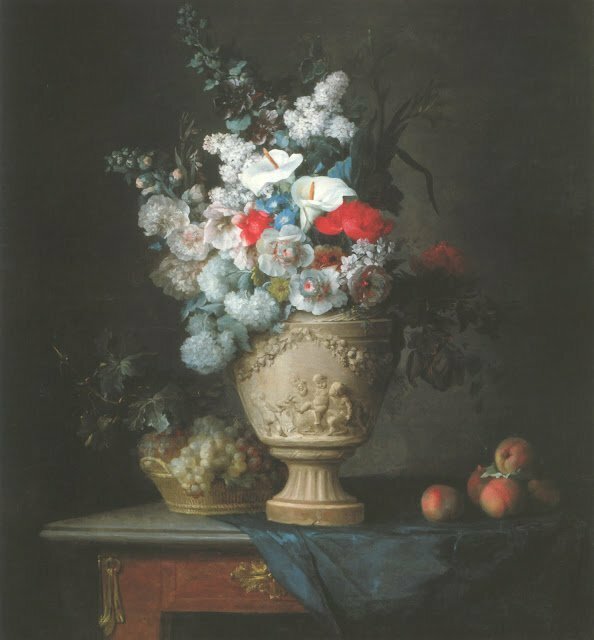 To fully appreciate the talent of Anne Valleyer-Coster as an artist take a look at a work she completed in 1776 entitled Bouquet of Flowers in a Terracotta Vase, with Peaches and Grapes. This still-life painting was one of a pendant pair and was commissioned by a high-ranking official of the entourage of the Queen of France, Marie Antoinette. Both paintings were exhibited at the Salon of 1777, the year after they were completed. One has come to recognise her expertise in the way she depicts flowers but in this painting we see how accomplished she was when it came to her bas-relief imités. Look carefully at the vase and the depicted bas-relief work. In sculptural terms, Bas-relief is a form of sculpture in which a solid piece of material is carved so that objects project from a background. This painting combines a number of different elements. We have the exquisite floral painting. We have the still-life depiction of the terracotta vase and the various fruit and finally we have the bas-relief imités depicted on the vase. The skill of the artist in completing such a work is dramatic and totally eye-catching. Vase of Flowers and Conch Shell by Anne Vallayer-Coster (1780). Another famous work of hers is Vase of Flowers and Conch Shell, which she completed in 1780. This work of art is thought to be one of three small oval paintings of flowers and fruits which she exhibited in the Salon of 1781. The flowers are a selection of anemones and marguerites. Look carefully how she has depicted the light reflecting on the gilt of the blue porcelain vase and the vase itself and how it shimmers on the multi-coloured conch shell. She has paid close attention to the various textures of the objects on display and how the light reflects differently on their surfaces. 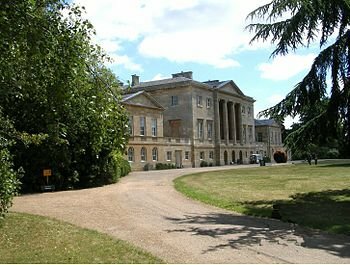 A number of her paintings are in British galleries but her still-life work, Garden Still Life, with Implements, Vegetables, Dead Game, and a Bust of Ceres (The Attributes of Hunting and Gardening) can be found in Basildon Park, Berkshire, a country house run by the National Trust of Great Britain. The Palladin-style house itself is worth a visit. It was built between 1776 and 1783 for Sir Francis Sykes, a wealth English landowner, Member of Parliament and who was once the Governor of Kasimbazar, India. Valleyer-Coster received this painting commission along with its companion piece, A Still Life of a Vase of Flowers, Fruit, and a Bust of Flora, on a Table in an interior from Joseph-Marie Terray, abbé de Molesme, who was the directeur-général des Bâtiments du Roy and contrôleur–général des finances. The National Trust came by this work of art when it was allocated to them by the UK Government who, in 2010, had taken it in lieu of inheritance tax from the state of Lord and Lady Iliffe, the previous owners. The setting is a park and in the work we see a rake and scythe propped up against a plinth. In the foreground there is a variety of vegetables, a cardoon or wild artichoke, a gourd, a marrow, a melon, a cabbage, a tomato, along with a sickle. On the plinth itself besides the bust of a young woman with an ear of corn in her hair, we see depicted a gun, game-bag, two dead partridges and a hare. 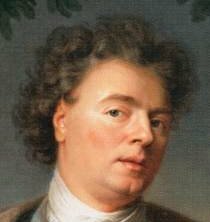 When the fall of the ancien régime came during the French revolution all those close to Louis XVI and his wife Marie-Antoinette were in great danger and many of the artists, such as Vigée Le Brun, had to go into exile to save themselves. Anne Valleyer-Coster was fortunate in as much as, regardless of her closeness to the queen, who along with her husband, Louis XVI, was hated by the common people, she managed to survive the bloodshed of the French Revolution. However, along with the fall of the French monarchy, went her primary patrons and her lucrative commissions dried up completely. She, as an artist, was forgotten during these turbulent times. 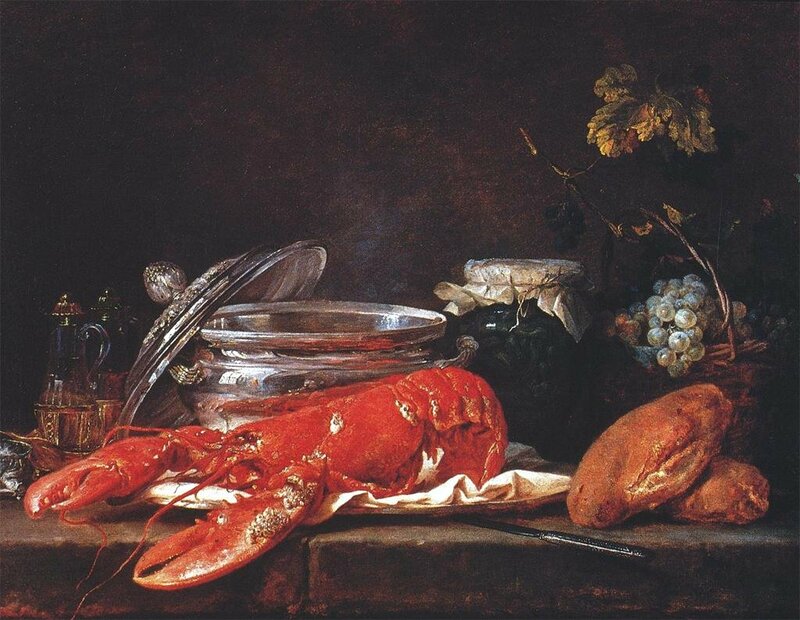 It is interesting to note that a painting, Still Life with Lobster, which she completed in 1781. Many believe it to be her best still-life work. In 1817 she exhibited it in that year’s Paris Salon. This painting came into the hands of Louis XVIII after he had been restored to the French throne in 1814. Some art historians believe Vallayer-Coster gave it to the king as an expression of her joy as somebody who had remained loyal to the Bourbon cause throughout the turbulent years of the Revolution and the following Napoleonic imperialism. However, it should be noted that she had produced two works of art in 1804 for Napoleon’s Empress Josephine. In the work, she has included many of the previous objects she had incorporated in earlier still life works. 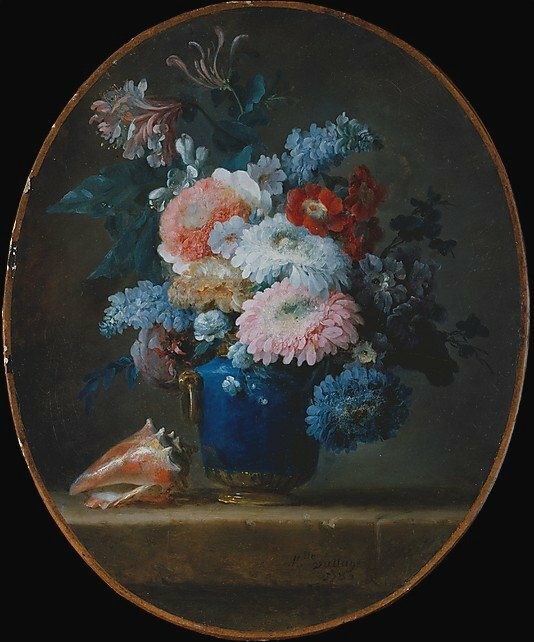 Anne Valleyer-Coster was one of the greatest still-life painters of the eighteenth century and art historians believe that her work was influenced by the great Jean-Baptiste-Siméon Chardin who died in 1779 and who is still considered to be one of the greatest French still-life and genre painters. She imitated his dark and shadowy tabletops on which were her arrangements of fruit, bread and dead game. In her later years she turned to a more unrestrained lavishness which was seen in Dutch floral painting. She died in Paris in 1818, aged 73 and will always be remembered for her still-life works with their distinctive colouristic brilliance and their almost photographic quality. If you are lover of still-life and floral paintings, you will love her beautiful works of art. 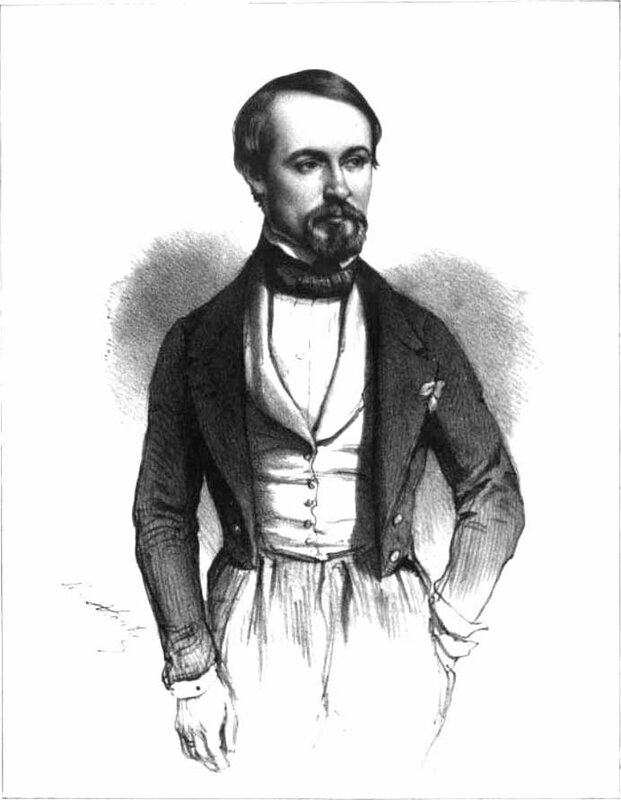 Alexandre-François Desportes. The Animal and Still Life painter. When I looked at works by Gabriel Metsu in a recent blog I featured a couple of scenes which depicted hunters. 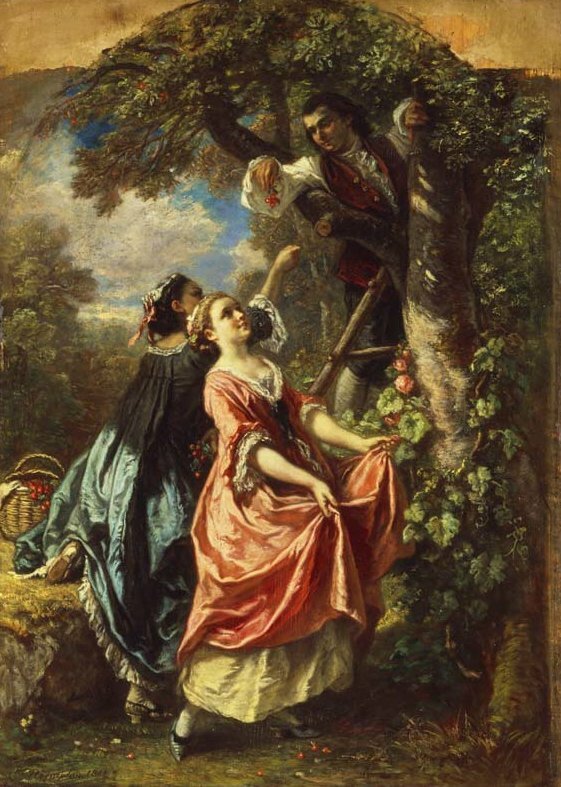 Scenes with hunters were very popular at the time especially with the upper classes and nobility as hunting was a pastime of the rich and so any painting which depicted the hunter alluded to wealth. Hunting in the eyes of the nobility was one of the last symbols of class distinction. 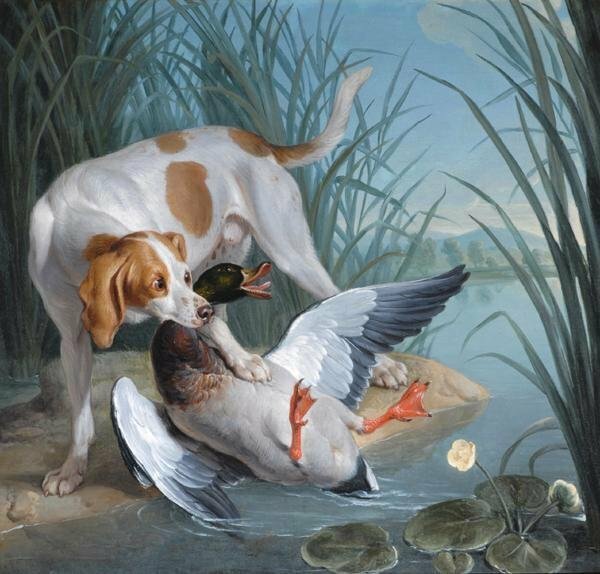 It was not just the portrayal of the hunter and the hunt which was popular with the wealthy classes but also the portrayal of the hunted – the prey and the hunting dogs. Today I am featuring the works of the French painter and decorative designer who specialised in animal paintings. Alexandre-François Desportes. During the 1680’s he assisted the French painter Claude Auran III in supplying paintings for Louis Joseph de Bourbon, Duc de Vendôme’s Chateau d’Anet. Artists survive on commissions and without commissions they struggle to make ends meet. France at the end of the seventeenth century struggled financially as it had been a century of costly wars. France and Spain clashed during the Franco – Spanish war (1635 – 1639) and again between 1683 and 1684 during the War of Reunions. The French and the Dutch clashed between 1672 and 1678 and France went into battle with most of its neighbours in the War of the Grand Alliance (1688-1697). Wars cost money – lots of money and in consequence, the French government had no money left for grand artistic endeavours, which meant that lesser known painters, who had yet to establish their reputation, struggled to make a living. Desportes did struggle but despite his financial hardship, Alexandre-François Desportes married Eléonore-Angélique Baudet. His wife was a linen and lace maker and through her occupation she was able to support her husband and allow him to search out commissions and carry on with his studies. Desportes luck changed when in 1695 he received an invitation from the French ambassador to Poland to come to the court of the Polish king John III Sobieski who was also the Grand Duke of Lithuania. Desportes was commissioned to paint portraits of the king, his wife Maria Kasimiera and some of the palace courtiers. His stay at the royal court lasted less than a year as the Polish king died in June 1696. 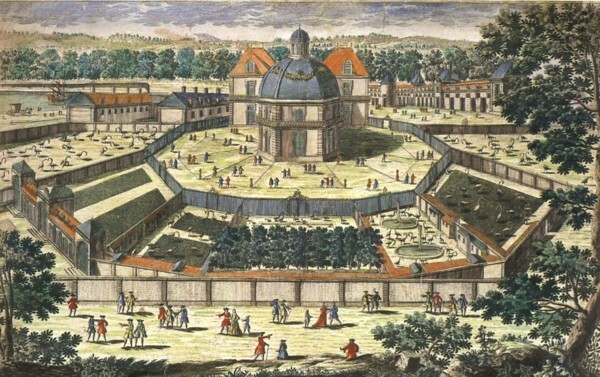 Desportes was summoned to return to France by Louis XIV. 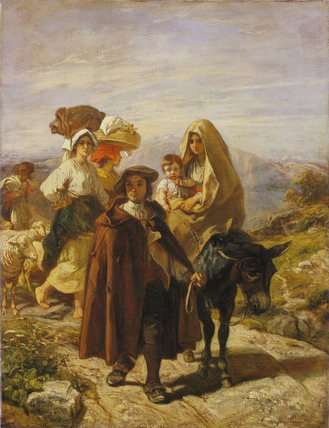 Desportes had spent a number of years painting portraits of wealthy people and he intended to carry on doing this when he returned to his homeland. However he soon found that the art establishment was awash with highly skilful portraitists and realised that it would be difficult to obtain portraiture commissions and so he decided to revert back to the training he received from Nicasius Bernaerts – the depiction of animals and still life painting and as a twist to this he would incorporate the two in his artistry. 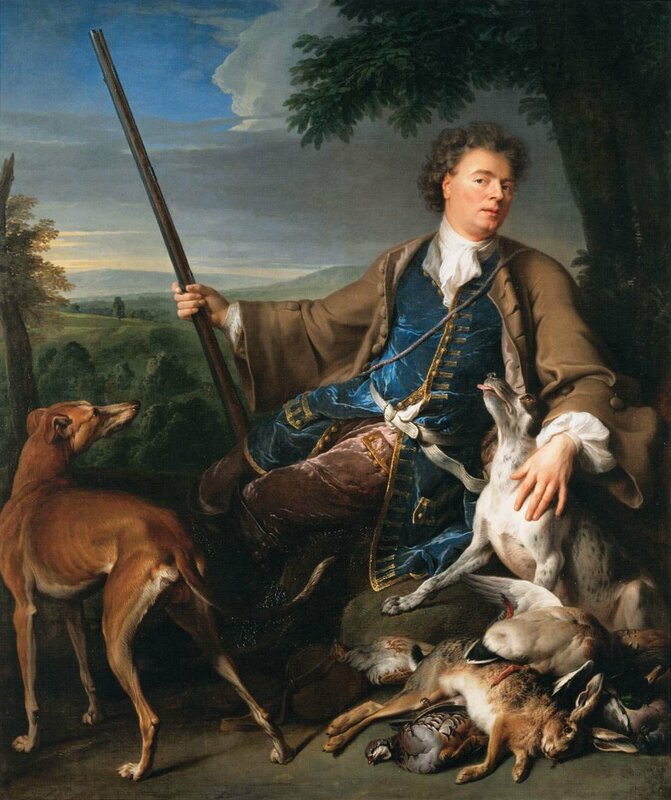 In August 1699 Desportes was received into the Académie Royale as an animal painter and his reception piece was Self Portrait as a Hunter. The painting, in which we see the thirty-eight year old artist seated in a landscape with his two hunting dogs and a large array of dead game, was a move away from the normal self-portrait as he has used the setting and what has been included in the work was a tribute to his own skill as a specialist animal painter as well as being a talented landscape artist. He was advertising his abilities! Louis XIV had started to have his palace at Versailles built in 1664 and he decided to incorporate a menagerie within the palace’s park. The design of his menagerie was in line with other Baroque menageries of the time with its circular layout, in the centre of which was a magnificent pavilion. People were able to walk along the paths which surrounded this central building, and alongside them were the cages which housed the wild animals. The king had been very impressed with the animal paintings of Desportes and commissioned him to complete five works of art which depicted animals and hunting scenes for the menagerie pavilion. Desportes, like a present day method actor who immerses himself into his character, often went on hunting trips with Louis XIV so that he could realise the thrill of the hunt. 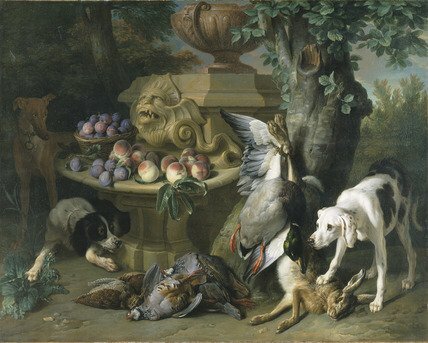 During the hunt he would carry with him a small notebook in which he would make on-site sketches of the hunt “trophies” – the dead animals, which could then be used later for still-life depictions of the game that resulted from the day’s hunt, Louis XIV would then choose the best sketches and Desportes would go off and complete an oil on canvas painting of the king’s chosen subject. Four such paintings, Deer Kill, Boar Hunt, Wolf Hunt and Hounds Guarding a Dead Deer, still survive and are housed in the private Paris museum, Musée de la Chasse et de la Nature (Museum of Hunting and Nature). 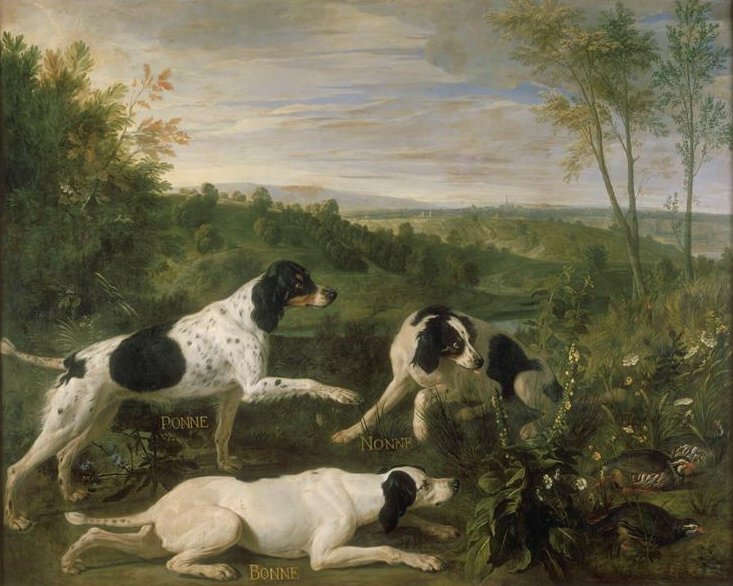 Louis XIV was so pleased with these paintings that in 1702, he commissioned Desportes to paint six works, portraying the portraits of the hunting dogs which were his personal favourites. In one such work entitled Bonne, Nonne and Ponne we see the king’s three favourite hunting dogs chasing and flushing out pheasants and partridges from the long grass. The king was so pleased with the work Desportes produced for him that he awarded him a pension and two years later he made Desportes a councillor of the Académie Royale. Desportes reputation as an artist spread outside of France and soon he was in high demand. In 1712 he visited London and stayed for six months working on commissions. When Louis XIV died in 1715, Desportes carried on working for the Regent of France, Philippe, Duc d’Orleans, who was ruling for the infant Louis XV, the grandson of Louis XIV and over time provided many paintings for the royal residences at Versailles, Marly, Meudon, Compiègne and Choisy. 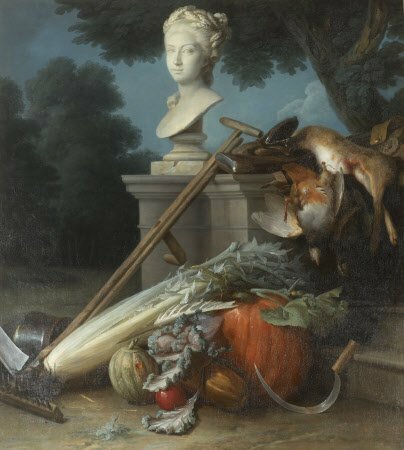 It was not just hunting scenes that Desportes had mastered for he also spent time painting still-life works featuring the dead “trophies” brought back from the hunt cleverly arranged alongside floral displays or displays of vegetables lying on a table or even in landscape settings. 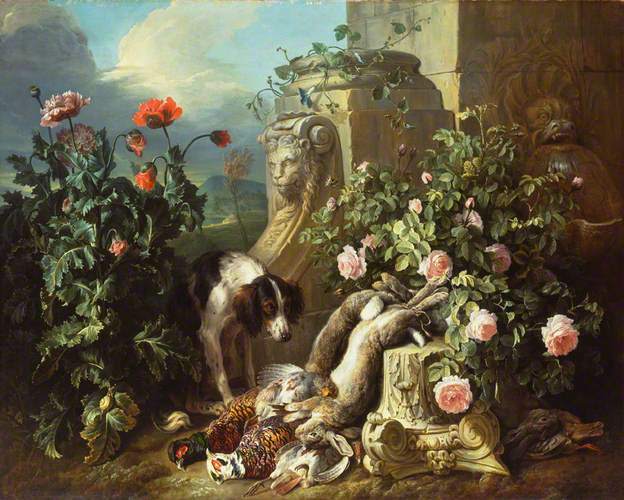 Two such paintings, Dog, Dead Game and Fruit and Dog with Flowers and Dead Game completed in 1715, can be seen in the Wallace Collection in London. There is an interesting connection between the buyer of these paintings and where they are housed today for the purchaser of the paintings, Lord Hertford, also owned a house in London known as Manchester House, situated in Manchester Square. He was an avid art collector and built up a sizeable collection of European art. On his death in 1870, his illegitimate son, who had acted as his secretary, Sir Richard Wallace, inherited his father’s unentailed estates, and large collection of art in 1871. Wallace added to the collection himself, and in 1897, after his death, the works of art were donated to the nation by his widow. They are now housed in what was his London home, Hertford House, Manchester Square, London, and are part of the Wallace Collection. 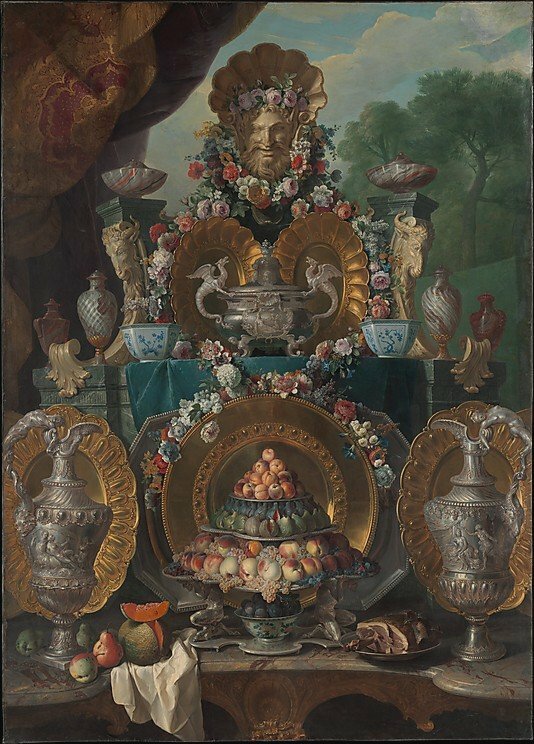 Several of his still-life paintings which combined game with fruit or flower displays also featured some beautiful pieces of silverware which came from Louis XIV’s collection. 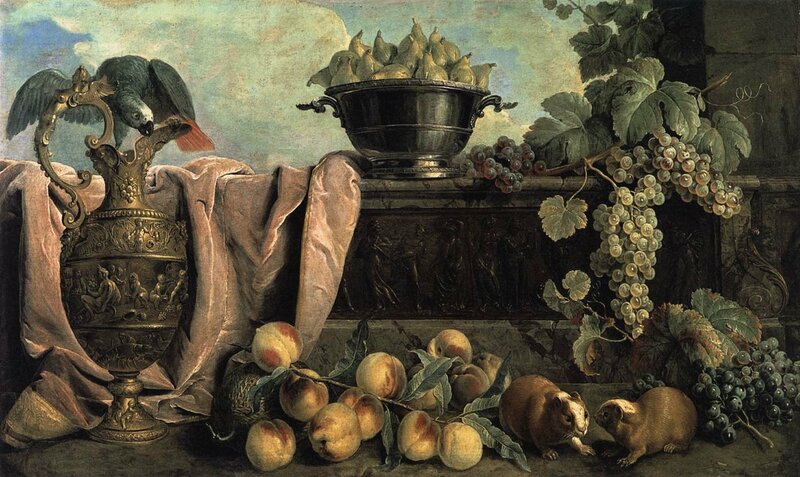 One such painting is entitled Still Life with Silver and was completed around 1720. Before us is a buffet laid out with an array of objects in silver, porcelain, and semi-precious stone as an array of fruit. The gold and silver vessels are displayed on a tiered console table which is weighed down with fruit and flowers. The composition is monumental in scale, measuring 262cms x 187cms (almost 8ft x 6ft). This is what one might have seen as a centrepiece on the table if we had attended a royal banquet. At the centre we can see the dragon-handled tureen and vermeil salvers both of which are in the Régence style of 1715-23. Alexandre-François Desportes died in April 1743, aged 82. He left a legacy of paintings and sketches as well as his cartoons which were used as designs for tapestries made up at the famous Parisian tapestry company, Gobelins. Many of his designs were also used at the Savonnerie company, the Parisian carpet factory at Chaillot, which manufactured the most prestigious European manufacturer of knotted-pile carpets. Author jonathan5485Posted on February 5, 2014 Categories Alexandre-François Desportes, Animal painter, Art, Art Blog, Art History, French painters, Hunting scenes, Still life paintingsTags Alexandre-François Desportes, Animal painter, Art, Art Blog, Art History, French painter, Hunting scenes, Still life paintings4 Comments on Alexandre-François Desportes. The Animal and Still Life painter.